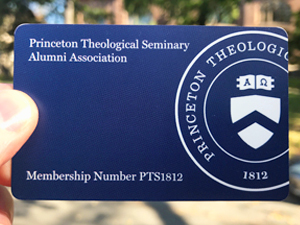 Alumni Relations is dedicated to keeping alumni in touch, informed, involved, and invested in Princeton Theological Seminary. We want to steward meaningful, life-long relationships between alumni and Princeton Seminary to support and enhance your ministry. More than 11,000 Princeton Seminary alumni are serving throughout the world! Events like reunion and alumni gatherings are just a few of the ways you can connect with us. Be sure to take advantage of the free library resources*—subscription databases, the Theological Commons, and lifetime borrowing privileges that are available to you as Princeton Seminary alumni. Video Tutorials: How to Access PTS Library Resources, Anywhere in the World! Videos and podcasts from the library are available here. How to Request a Network ID (to log in to the Seminary network) *In order to access some of these resources, you will need to register for a network ID. To request a network ID, please contact the PTS Help Desk by email (help.desk@ptsem.edu) or at 609.497.7812. Visiting campus? Show your Alumni Benefits Card and receive discounts from local, Princeton establishments. For more information, or to request a Benefits Card, contact: Alumni@ptsem.edu (609.497.7756).